There is no rule that says heartbreak must be a prerequisite for good judgment. If you don't want to be a divorce statistic and are ready for a long-lasting relationship, this book's for you. In today's divorce culture, too many people have stopped trusting their ability to build a loving and lasting marriage. Now renowned relationship coach and counselor Chana Levitan reveals the 10 essential questions everyone should ask before saying "I do." Readers will learn how to: spot long-term potential; know the difference between infatuation and love-how they work against each other and yet how they can work together; reevaluate their approach to love and what they really need to succeed in building a loving marriage; gain the confidence to steer through the decision making process of dating; and more. 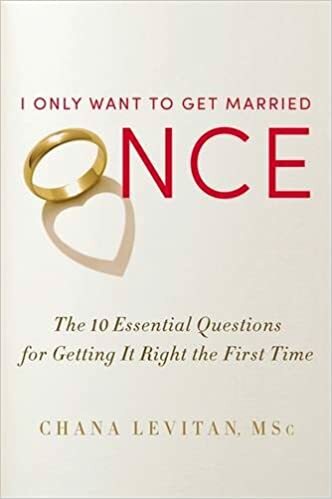 Filled with real-life anecdotes and insightful advice, I ONLY WANT TO GET MARRIED ONCE helps readers get it right the first time.